“WIN ?? Did you know Aussies throw out 20% of the food they buy? ? 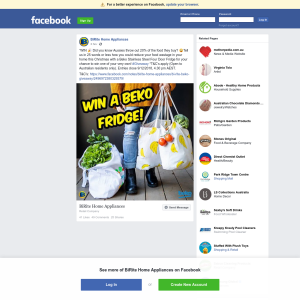 ?Tell us in 25 words or less how you could reduce your food wastage in your home this Christmas with a Beko Stainless Steel Four Door Fridge for your chance to win one of your very own! #Giveaway *T&C’s apply (Open to Australian residents only). Entries close 9/12/2018, 4.30 pm AEST. 1. Participation in this promotion is deemed acceptance of these terms and conditions. Entry is open to Australian residents only. Only one (1) entry per individual will be accepted. 3. This offer is open to all QLD, NSW, NT, VIC, SA, WA residents. Directors, management, employees, officers and contractors (and their immediate families) of the Promoter or of the agencies or companies associated with this Promotion are ineligible to enter. Participants under the age of 18 must first seek permission from their parent or legal guardian. 4. The competition commences at 8.30am AEST, 6/12/18 – ends 4.30pm AEST 9/12/2018. Entries must be received before 9/12/2018, 4.30 pm AEST to be considered eligible to win. The winner will be posted on the https://www.facebook.com/BiRiteHomeAppliances/ Facebook Page and the winner MUST contact the page via PRIVATE Message with correct personal contact details to claim the prize. “WIN ?? Did you know Aussies throw out 20% of the food they buy? Tell us in 25 words or less how you could reduce your food wastage in your home this Christmas with a Beko Stainless Steel Four Door Fridge for your chance to win one of your very own! #Giveaway *T&C’s apply (Open to Australian residents only). Entries close 9/12/2018, 4.30 pm AEST. 1. It is the responsibility of each eligible entrant to ensure that their details, including their phone number and address are correct and up to date in their Facebook private message. The judging will take place 2936A Logan Rd Underwood QLD 4119 from 8.30am 11/12/2018 until 4.30pm 11/12/2018 AEST. 2. The winning entry will be subject to the discretion of the judging panel. The winner will be published on https://www.facebook.com/BiRiteHomeAppliances/ Facebook Page at 4.30 pm 12/12/2018 AEST. 3. If the prize is not claimed by 18/12/2018 4.30pm AEST the winner’s entry will be deemed invalid and the Promoter reserves the right to conduct further judging at 8.30pm 21/12/2018 AEST at the same location as the original judging as are necessary to distribute the prize. If any redrawn prize is not claimed by the 5/1/2019 4.30 pm AEST the prize will be forfeited. 4. The judges’ decision in relation to any aspect of the competition is final and binding on each person who enters. This is a game of skill. Chance plays no part in determining the winner. All entries will be judged individually on merit. No correspondence will be entered into. 5. The Promoter reserves the right to verify the validity of entries (including an entrant’s identity, age and place of residence) and to disqualify any eligible entrant where the Promoter believes that the entry or the entry process has been tampered with or where any entry has been submitted not in accordance with the Terms and Conditions. 6. The Promoter accepts no responsibility for any lost, late, misdirected claims or correspondence due to incorrect entrant information. 7. The Promoter collects entrants' personal information in order to conduct the promotion. If the information requested is not provided, the entrant may not be able to participate in the promotion. The Promoter will not disclose this information to anyone other than contractors who provide services to the Promoter for the purposes of conducting this promotion unless compelled or permitted by law. 8. If the prize is unavailable, the Promoters, in their discretion, reserve the right to substitute the prize with a prize to the equal value and/or specification, subject to any written directions from a regulatory authority. 9. The Promoter reserves the right, at its sole discretion and without notice, to cancel, modify or suspend these terms and/or this promotion in whole or in part, including, but not limited to in the event of fraud, technical or other difficulties or if the integrity of the Promotion is compromised, subject to any written directions from the various lottery departments and without liability to the participant. The contact details of the winning entry may be passed onto a third party for prize notification and fulfilment. 10. The prizes cannot be assigned, transferred, redeemed for cash, or substituted except by the Promoter who may at their sole discretion, subject to the relevant state authorities, substitute any prize with one of comparable value if the advertised prize is or becomes unavailable for any reason. The Promoter will not replace any lost or stolen prizes, or take responsibility for any broken products in the delivery of the product or after it has been delivered. It is not the responsibility of the Promoter to insure any products. 11. If for any reason the winner does not take the prize by the time stipulated by the Promoters, then the prize will be forfeited. 12. Subject to the terms and conditions of the participating prize provider(s), if for any reason the winner does not, once the prize has been booked, take the prize (or an element of the prize) at the time stipulated, then the prize (or that element of the prize) will be forfeited and will not be redeemable for cash. 13. The prize, or any unused portion of the prize, is not transferable or exchangeable and cannot be taken as cash. 14. In the event of war, terrorism, state of emergency or disaster, the Promoters reserve the right to cancel, terminate, modify or suspend the promotion or suspend or modify a prize, subject to any written directions from a relevant regulatory authority. 15. Entrants consent to the Promoter using the entrant’s name, likeness, image and/or voice in the event that they are a winner (Inc. photograph, film, and/or recording of the same) in any media for an unlimited time without notice or remuneration for the purpose of promoting this competition. 17. To the extent permitted by law, the Promoter (including its officers, employees and agents) and its associated agencies and companies will not be liable for any loss (including, without limitation, direct, indirect, special or consequential loss, or loss of profits), expense, damage, personal injury or death which is suffered or sustained (whether or not arising from any person's negligence) in connection with this promotion or accepting or using any prize. 18. This promotion is in no way sponsored, endorsed or administered by, or associated with Facebook.